The no carbonated water noodles which the noodles used 100% of domestic wheat flour, and gave a waist by the original manufacturing method. 100% of frying oil uses vegetable oil. The specially made soup did not use a chemical seasoning and chicken pork beef extract at all and finished it with a plant material and the taste of the scallop. 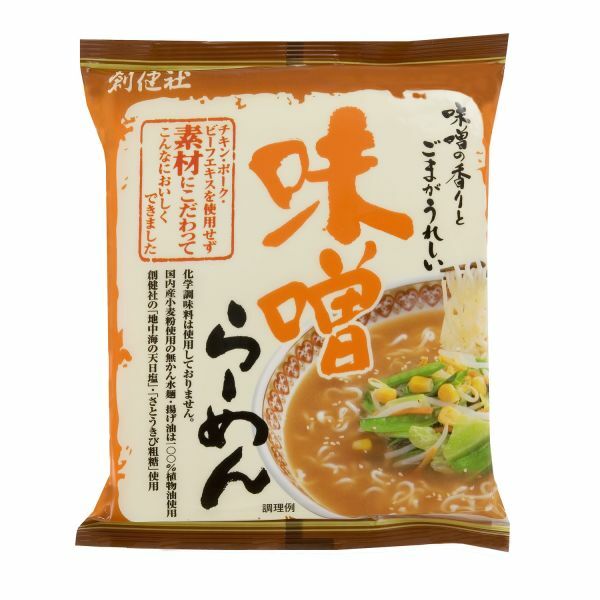 The miso assumes the genetically-modified soybean which there is not raw materials, and a nice smell of the sesame enhances a fragrance of the miso still more. The soup which I used mainly on a plant material to be able to eat in peace is soup of the not different new suggestion new at all of the depth of body, the taste than soup using the meat extract essence. Using "sun-dried salt of the Mediterranean Sea" of Sokensha where the sun dried Italian seawater in soup for about a half year and "the sugar millet unrefined sugar which left sugar millet original taste," it enhances a characteristic of the material still more. ■A preservation method: You avoid direct rays of the sun, and please keep it if possible in the cool and dark space.